They're talking about building a city of Toronto museum and the Star is reporting they may build it by the giant Canada Malting Company silos. 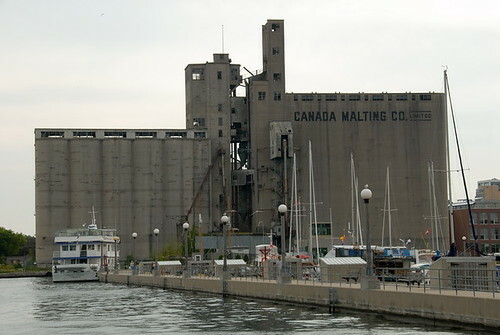 I have a long and interesting history with the Canada Malting Company silos. For a couple of summers in the early 90s, by pal Ed and I would bike to the abandoned Canada Malting Company building on the lake shore, break in and explore. It was awesome. Once you adapted to the smell, there were so many levels and deserted rooms, it was fascinating. We went through a very interesting abandoned building investigation phase, but the Canada Malting Company silos remained our favourite destination of all. The article suggests they're building this museum by the silos as opposed to tearing them down and building anew. I hope the facade of that old building is preserved so there's a constant reminder of my adventures with Ed as a sixteen and seventeen year old. The malting plant is so much more than just a memory of exploration. The utilitarian architecture is stunning, and it is a giant relic of a time when the whole waterfront was a port. It must have been awesome in the early 90s, before the vandalism!